Elizabeth I was perhaps the most influential monarch in English history. There are episodes in her life that became legendary. From her tumultuous childhood to her reign where everyone either wanted her to marry or put someone else on the throne, Elizabeth’s life was hardly easy. Even though much is known about her public life as queen, we really do not know a lot about her private life. In Alison Weir’s book, “The Life of Elizabeth I”, the gap between the public Elizabeth and the private Elizabeth is bridged in order to give a more complete biography of this fascinating English queen. Weir begins her book with the coronation of Elizabeth, touching briefly on Elizabeth’s childhood and how she got to the throne. She explains the England that Elizabeth knew and how right after she was crowned, her people desired for the queen to have a husband and to know what religion she would adopt for her own and for her country. Although Elizabeth liked to have quite a few favorites, including Robert Dudley and Francis Duke of Anjou, she never gave her heart solely to one man. Instead she chose to be the mother of her country and to be married to the job of protecting her people. Elizabeth not only had to keep her people happy but she had to deal with threats from other countries, including King Philip II of Spain and his Armada, the St. Bartholomew’s Day massacre of the Huguenots in France, and the religious feuds in the Netherlands. One of her biggest external threats was her cousin Mary Queen of Scots, who claimed that she should be Queen of England. Elizabeth eventually had to make the decision to execute another queen, very similar to the decision her father had to make when he had Elizabeth’s mother executed a few decades before. Elizabeth also had to deal with internal threats such as favorites, especially Robert Devereux, the 2nd Earl of Essex, becoming jealous of others in court and throwing fits. There were those who would dare to marry without the Queen’s permission and had their own children. In these instances, Elizabeth’s anger would come out in full force. She didn’t trust many people and tended to keep her feelings to herself. To the outside world, she was “Gloriana” or “The Virgin Queen”, but to those who truly knew her, she was just Elizabeth, a woman who became queen and who was just trying to survive for herself and her country. Elizabeth I has always been my favorite Tudor monarch. Her story was the one that really got me interested in the Tudors and this book made me fascinated with her all over again. Alison Weir was able to yet again combine her engaging writing style with amazing details to tell the full story of the reign of Elizabeth I, from her coronation at age of 25 to her death at the age of 69, and how she changed England for the better. I loved reading this book. There was so much information about Elizabeth that I didn’t know about in this book, it was like discovering a whole new side to a person I thought I knew very well. 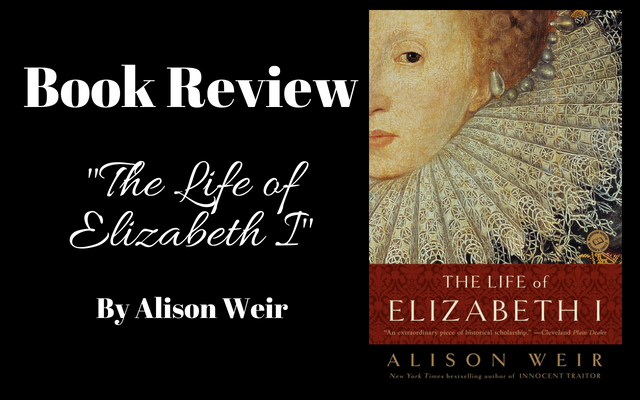 If you want to learn more about Elizabeth I, the woman behind the legend, and her impact on England and the 16th century world, I highly recommend you read this book, “The Life of Elizabeth I” by Alison Weir. An absolutely fascinating read on one of England’s most remarkable rulers. Yes the most influential British monarch and highlighted an issue that is still ignored today and that is that husbands owned their wives and still do in parts of the world. It took a long time for this kind of slavery to be acknowledged and done away with in the ‘western world’.